We’re back again with a look at trade candidates, fantasy football players you might want to add based on possible production heading into Week 12 of the NFL season. In particular for future opponents, my FLEA market finds will have an eye on the favorable playoff matchups that could help win you a championship. Since the Cowboys traded for Amari Cooper, Prescott has thrown for 721 yards and scored five combined touchdowns in three games. He has scored the 10th-most fantasy points at the position in that time. That’s a pleasant improvement from his and the team’s struggles at the start of the year, but it falls short of what I expect him to do in the fantasy playoffs. The Cowboys have an extremely passer-friendly schedule over their final month. Starting in Week 14, they play at home against Philadelphia, travel to Indianapolis, and return home for Tampa Bay. That’s three consecutive dome games. Meanwhile, the Colts, Bucs, and the team’s Week 17 opponent, the Giants, all promote passing touchdowns by between 15 and 30% compared to a typical team. That’s the best Prescott has seen since the first five weeks of the season and should thrust him into fantasy relevance when it means the most. Freeman took a back seat to rookie teammate Phillip Lindsay in his return from a high-ankle sprain on Sunday but did manage a fantasy-day-saving touchdown. That’s nothing new for Freeman, whose standout advantage over Lindsay is his power. He doesn’t have a stranglehold on the team’s red-zone touches, but he does outweigh Lindsay by about 40 pounds and has twice as many carries inside the 3-yard line in the games they’ve both played. None of that makes Lindsay a bad fantasy option over the rest of the season, but the less expensive Freeman should be in for a particularly favorable rest-of-season schedule given his skill set. The Broncos’ next five games are against the Steelers, Bengals, 49ers, Browns, and Raiders. Four of those five teams are in the upper half of defenses in promoting rushing touchdowns. Despite their own modest record, the Broncos seem good bets to build leads in the majority of those games and rely on the running game to kill clock. That should offer an opportunity for both Lindsay and Freeman to shine. 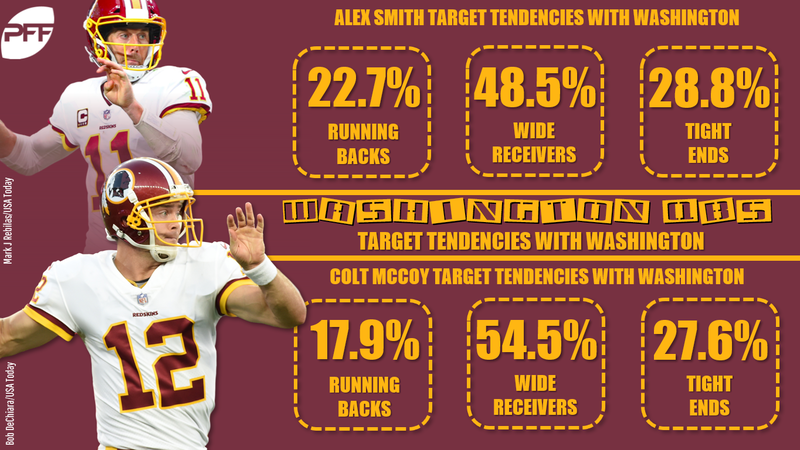 I made the case for Colt McCoy as a fantasy sleeper in deeper formats Tuesday, but he should not be the only Redskins player to see a bump in fantasy value following Alex Smith’s season-ending injury. Smith has always had an atypical approach to the position and relied more heavily than most quarterbacks on passes to his backs and tight ends. That has definitely been the case relative to McCoy in their respective time with the Redskins. Since 2014, McCoy has thrown 54.5% of his passes to wide receivers, 6.0% more often than Smith has. Correspondingly, McCoy has thrown a smaller percentage of his throws behind the line of scrimmage and a higher percentage of his throws 10 and 20 yards down the field. All of that points to an increase in targets for deep-threat wideout Doctson, who teased at that potential in seeing half of McCoy’s 10 aimed targets after he took over in Week 11. Sammy Watkins was able to return and start after just a one-game absence for his foot injury, but his being limited to five snaps in Week 11 suggests the injury might be more serious than it was originally reported to be. 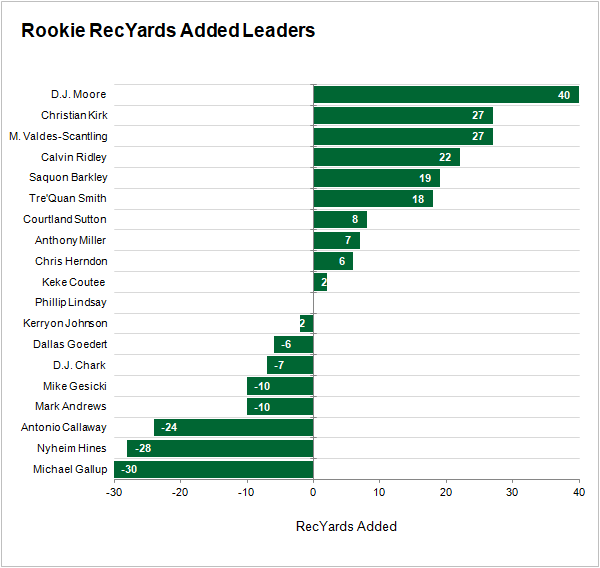 Obviously, his absence didn’t do much to slow the Chiefs’ passing offense, and Conley was the major beneficiary. He’s played about 90% of the team’s snaps the last two weeks. Workload is pretty much the only thing you need to be a fantasy asset in that offense. Conley himself is on a 13.8-touchdowns-per-100-target pace, which is top-five in football. If Watkins continues to be limited after the team’s Week 12 bye, then Conley will be usable even in shallow formats. The Raiders are running low on bodies at wide receiver. In the several weeks since they traded No. 1 receiver Amari Cooper and have lost Martavis Bryant possibly for the season with a PCL injury, Jordy Nelson for likely another week or more with a bruised knee, and now Brandon LaFell for the season with a torn Achilles tendon. Last week’s FLEA market find Marcell Ateman acquitted himself well with four catches and 50 yards in his first career game, but there is still a lot of targets that have to go somewhere. My best guess of where is veteran receiver Roberts. He led the team with seven targets on Sunday, and despite his modest totals then and all season, he’s been close to neutral efficiency in his limited opportunities. He’s a worthwhile add in deeper formats. Smith enjoyed a massive breakout game against the Eagles Sunday with 10 catches for 157 yards and a touchdown on 14 targets, but it’s easy to still be skeptical of his fantasy prospects. Last week was his first all season with more than six targets or three catches, and newly signed Brandon Marshall figures to make his debut with the team in Week 12. I’m more optimistic. Despite his modest workload, Smith has shown strong efficiency this season. His 18 Yards Added are now sixth-most among all rookies, and his rate of 0.69 Yards Added per catchable target is among the best at the position. Smith’s target volume may not be quite as assured as those of D.J. Moore or Courtland Sutton, but the prolific Saints’ offense should push him to fantasy relevance. The excitement over Humphries has faded after he made just five catches the last two weeks for the Buccaneers, but the team’s decision to once again go with Jameis Winston at quarterback should benefit him more than anyone. With Winston under center in 2018, Humphries has approached Mike Evans with a 19.5% target volume. It’s an 8.8% bump from what he’s seen from Fitzpatrick, and every other prominent receiver has seen his workload decline. Winston is enough of a reason to consider Humphries as a flex option, but he may have another with O.J. Howard lost to injured reserve. And the timing couldn’t be better for Humphries’ fantasy prospects. The team’s next two opponents, the 49ers and Panthers, both allow more than 20% more passing touchdowns per attempt than a typical team.